Shiny New Miniatures, Board Games, Books, and More! Posted: Sat Feb 18, 2017 6:23 am Post subject: Shiny New Miniatures, Board Games, Books, and More! 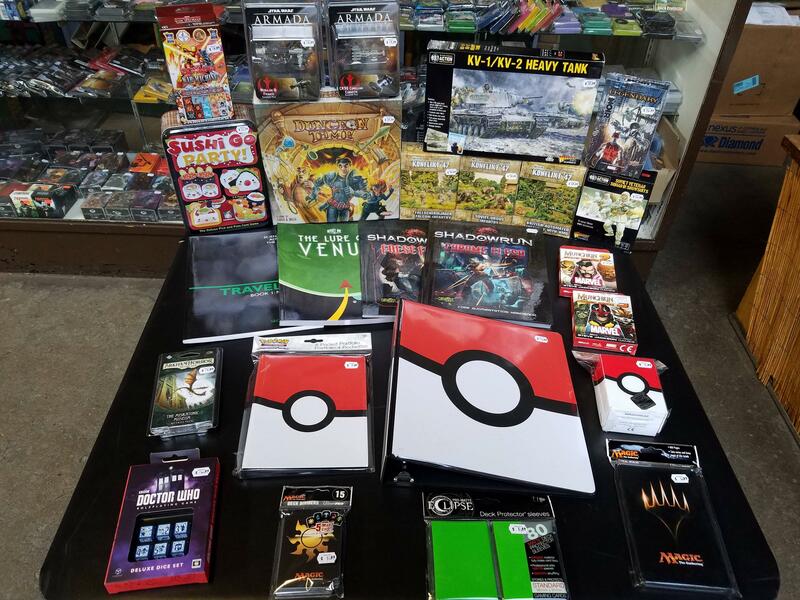 The long prophesied, sacred delivery of new stuff has arrived bearing gifts of shiny new board and card games, miniatures, RPG books, card game supplies, and more! New games include Sushi Go: Party!, Dungeon Time, and the new Arkham Horror Card Game: Miskatonic Museum expansion. There's also new miniatures sets for Bolt Action and Konflict '47, new RPG supplement books for Shadowrun (False Flag and Chrome Flesh), Traveller, and Rocket Age, as well as a new Poké Ball-themed binder, 4-pocket portfolio, and deck box. Head downtown today to check out these and all the latest and greatest new items in store!